When in need of support and guidance, following the loss of somebody special, R Butler & Sons Funeral Directors in Hailsham is here for you. Adhering to the highest of standards, you can place your trust in us to arrange a heartfelt and meaningful funeral for your loved one. Helping to make a difficult time a little easier, our caring professionals are available to ensure you can remember your loved one in the way you want. You will be treated with compassion and respect at all times, as we provide advice and help you to make the decisions that will shape the funeral. As part of the National Association of Funeral Directors (NAFD), we abide by a strict code of practice. You can rest assured that your loved one will be cared for with absolute integrity and that their send off will run smoothly and according to your wishes. 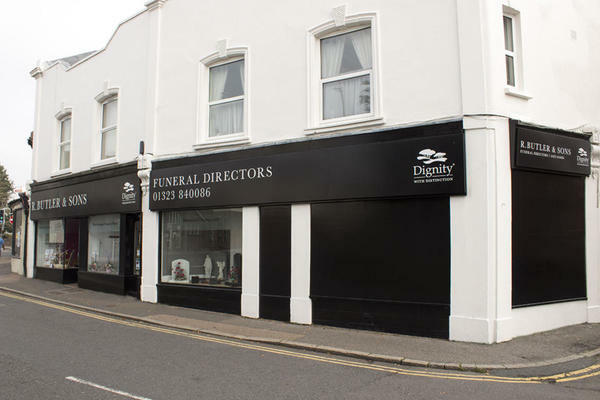 You can find our funeral home on Station Road, at the junction with South Road, and our location close to the centre of town makes us accessible to the whole of Hailsham. We are also able to serve families from our neighbouring communities in the Wealden district, such as Heathfield, Polegate and Uckfield. Our funeral directors has been a part of East Sussex since 1809, so you can rest assured that you and your loved one will be in safe and experienced hands. There will be somebody ready to listen, 24 hours. To arrange a funeral, call us today. Call us today on 01323 840086 to talk through your personal requirements. At R Butler & Sons Funeral Directors, we understand how special life is with those that you love. For us, every funeral is unique and personal. We have a service to fulfil every wish, with every detail carried out with the same uncompromising quality of care. From a traditional service, to a colourful woodland burial, your options are limitless with our Full Service Funeral. If you have a little more flexibility when it comes to arrangements, then we can provide a Simple Funeral for a lower cost. South Road Car Park is right next to our funeral home and is free of charge. We are opposite the on-foot entrance for South Road Car Park. Our staff are available 24 hours a day on 01323 840086 if you require our services outside of these hours.